When it comes to making investments, I get asked by a lot individuals on what they should be buying. The answer to that question is: It depends. I know that’s not the answer that you are looking for, but the reality of it is is that every single one of us is different. We all have different financial objectives, we’re all different in age and even more importantly we all think about money differently in an emotional way. Any good financial adviser will do a risk assessment with you prior to making any investment choices. That’s an absolute necessity because most individuals that visits their financial adviser will tell the adviser that “I want to make money. And I want to make money now. Fast!” Any prudent adviser should be reigning back the investor’s expectations if they hear this. Quick money making schemes don’t exist if you are truly investing. If you are looking for quick money, might I suggest Las Vegas? Risk assessments are usually performed by giving a series of hypothetical questions to the potential investor to see what their answer would be. This puts the investor on the spot to give an honest opinion but really it’s not the real thing. Hypothetical questions usually just induce hypothetical answers. When someone is sitting and answering a questionnaire they are probably going to answer it using their analytical mindset. The truth is, your true self only comes out when you are in your most emotional state. And that is something that can’t be measured. Alright I’m not talking about the NBC reality show Fear Factor. Let’s get that straight. If there was any way to measure fear, you can bet that the financial gurus at the stock market figured out how to do it. And use it to make money at the same time! The common indicator for fear is called the VIX index. This is a measurement of volatility in the marketplace over the subsequent 30 day period. As you can observe (above), over the last week the VIX index has actually risen by 63%. There’s great fear in the marketplace right now, as there should be, since there is a real possibility that Donald Trump will be the next president by Tuesday. So what does all the fear translate into? Falling stock prices. Over the last 9 days, as of this writing, the S&P has been falling steadily. So what does that do to your psyche? Have you been checking your investments? Have you been losing sleep daily because you’re losing money? Are you changing your spending patterns because the markets are down? These are all valid questions that you should ask yourself. Ultimately, unless you’ve been experiencing these 9 days of decline, you truly don’t know what the feeling is like. 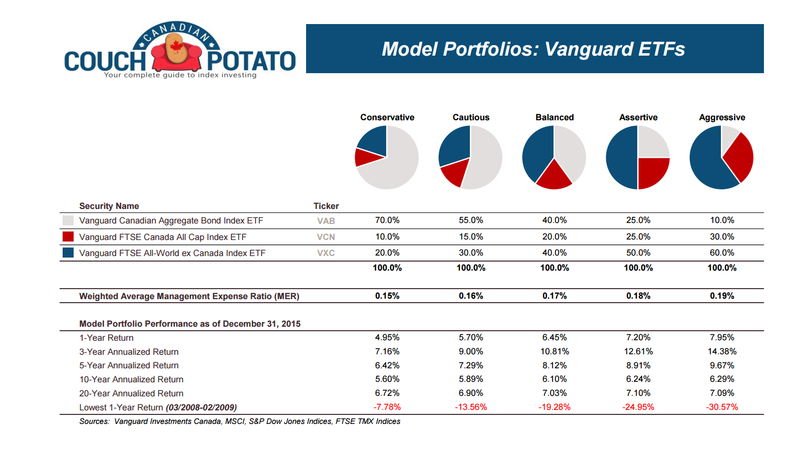 My favourite model investment portfolios at canadiancouchpotato.com outline various asset allocations based on an individual’s own risk tolerance. For someone that thinks they are aggressive, there is usually more money allocated to riskier assets like stocks. For the more conservative investor, more assets are allocated to bonds.The site is also very good at showing what the past performance has been over a range of years and the greatest single percentage drop that has happened in a year. In order to truly gauge what your risk tolerance is requires you to actually get your feet wet. Reading, talking and watching someone invest money is simply not the same experience as doing it yourself. Now I’m not going to write this suggestion and expect you to go put your life savings down on one of these model portfolios, but it would be wise to take a small but significant sum of money and try it yourself. For instance, invest $5000 dollars over a period of 6 months. See how the market works. Maybe you’ll lose 10% of your money. $500 dollars is a lot of money. How does that make you feel? Are you panicking? Is this whole experience of investing making you anxious? Or maybe you make 10%. Does that make you feel overly joyous? Do you feel more confident and start spending more money? All of these reactions are an emotional response towards your feeling of money. To be honest, if you feel any emotional attachment to the money you’ve invested, either positively or negatively, I would suggest you are not an aggressive investor at all. Gaining personal experience through investments is really the only way to see what kind of risk tolerance you really have. Once you’ve gotten the experience and seen the fluctuations in the marketplace, then it’s time to re-evaluate your investment positions. Your financial adviser or perhaps yourself, should be able to re-balance your investment portfolio to better suit your risk tolerance after you are better prepared to make a risk assessment on yourself. Life changes, that’s just a fact of life. We all age. Perhaps we want to go back to school, get married, have kids, take a sabbatical. Whatever it is, circumstances happen that make us have to re-evaluate our risk tolerance. If at any point during your life you find that your financial objectives become different, then it’s a good idea to adjust your asset allocation to meet those needs. When you near retirement, it’s prudent to go more into principal preservation rather than having to deal with the volatility in the stock market. It makes much more sense to start shifting your investments to a more conservative portfolio. Similarly, if your goals for your money go from long term to short term, then it’s important to action that as well. Even though I always preach buy and hold, it’s not the same as set and forget. When it comes to risk, no one can really tell you how much of a risk taker you are. That is something that is specific to you. What you really have to do is be honest with yourself. Don’t try to chase gains when you are uncomfortable with volatility. Remember that the difference in annual gains might just be as little as 0.5% between an aggressive and conservative portfolio. So it’s probably better that you get a good night’s sleep rather than trying to hit home runs.